Cypress Campground & RV Park, located in Winter Haven, FL is the Central Florida outdoor hospitality experience just 2.3 miles from Legoland and Legoland Waterpark. The pet-friendly RV resort is an easy drive to the attractions in Orlando, Florida including Disney, Epcot, Universal Studios, SeaWorld, and much more. This is an all-ages RV park that generally caters to seniors in the winter and families in the summer. We are also proud members of ARVC and FL-ARVC. Cypress Campground is the only RV park, RV resort, camping or campground on Cypress Gardens Boulevard (Route 540) in Winter Haven, Florida (Polk County). 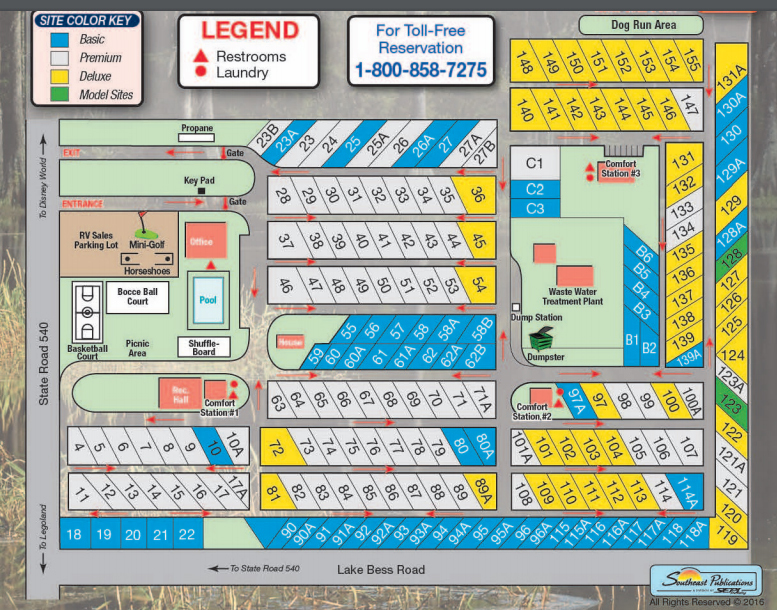 The Central FL RV park is 1.2 miles from Highway 27 and is 19 miles to Interstate 4 (I-4). The recreational vehicle park is adjacent to a Super Wal-Mart, with a private entrance within walking distance, perfect for family camping. The pet-friendly RV resort is surrounded by numerous Central Florida golf courses, lakes, retail shopping, theaters, restaurants, and many recreational activities. Cypress Campground has 200 RV camping sites with 120 pull thru sites, many of which are Big Rig friendly on 19 flat acres of outdoor hospitality. We provide a full set of amenities which include continuous activities during the winter months that cater to seniors while providing a family-friendly balance of campers and RVers. Cypress Campground Winter Haven is a highly rated Good Sam Park. Cypress RV Campgrounds include full hook-up to sewer/water, 30/50 amp electric, Wi-Fi, and 70 cable channels. Our RV resort accommodates all types of RVs including park model homes, motorcoach homes, fifth wheels, and travel trailers. Our Central Florida RV sites are rented daily, weekly, monthly, and on a six-month seasonal basis. RV rallies and groups are welcome. Our Winter Haven FL campground & RV park is pet-friendly. On-site management is available to provide our campers and guests the highest quality outdoor hospitality experience. Cypress Campground is a member of the ARVC and FL ARVC. The Park is located at longitude is 27.976638 and latitude is -81.651486. Are you interested in creating great memories that will last a lifetime? Come visit our Winter Haven, FL campground by calling today at (863) 324-7400, emailing at manager@cypresscampground.com or selecting our ‘reserve now’ option below. The following Rules & Regulations are for all guests of Cypress Campground & RV Park to preserve the park’s facilities and to ensure a pleasant living environment. We ask each guest to comply with these rules and regulations in order to create a compatible community in which we can all be proud. 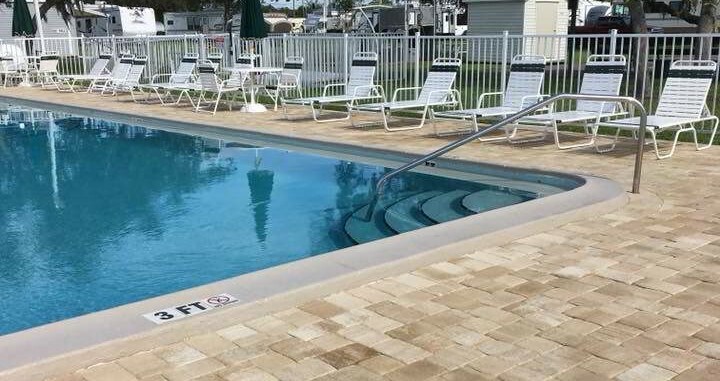 Cypress RV Park amenities include a large heated swimming pool, free mini-golf, shuffleboard, bocce, basketball, horseshoes, billiards, outdoor giant chess and checkers, or just walk, jog or bike on our grounds. Our RV campsites generally include full hook-up to sewer / water, 30/50 amp electric, Wi-Fi, and 70 cable channels. We accommodate all types of RVs including Park model homes, motorcoach homes, fifth wheels, and travel trailers.